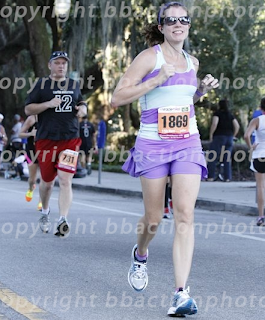 I ran Miracle Miles 15k on September 21, 2013 (yes, I realize I am more than 2 months behind...sigh). Here's our race shirt. Once again, the small is too big. They need to either make extra smalls or even better, gender specific shirts!! I was a little nervous because a) I hadn't run much in 3 weeks, since the Disneyland Half Marathon, because of my injury and b) because it was the first race I'd be completely alone from leaving my house to getting home. I did something really stupid. The day or two before the race, I went and got new shoes. I figured that my shoes had to be my heel problem so I went all the way up to Fleet Feet. I had them look at the way I ran again, and the girl decided I didn't need to be in Guidance shoes, but in Neutral shoes. I had always ran in Guidance but I'd been told several times I didn't really need it so I decided to try the Brooks Defyance. Dumb dumb dumb. As for the being alone, it was a little awkward to just be standing around by myself and to ask someone to take a picture of me (not sure why, since I ask random strangers to take pictures of me and my friends all the time). 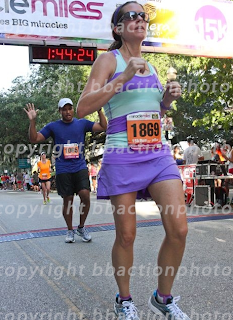 But I needed my pre-race photo. I'd never done a race completely by myself before. The only other time I'd run alone, my parents and hubby were there and I ran with a friend the first 3 miles. But this time I was alone from beginning to end. But luckily I ran into one of my friends (and teachers at my school), Jen. It was her first 15k and she rocked it! 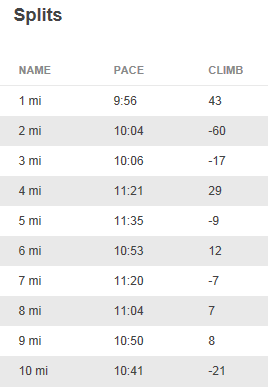 Anyways, I finished the race only a little past a minute over my other 15k time so not too bad. After the race they had several tents. There was an insanely long line for Panera bagels so I skipped it and got a smoothie sample and walked around for a little bit. 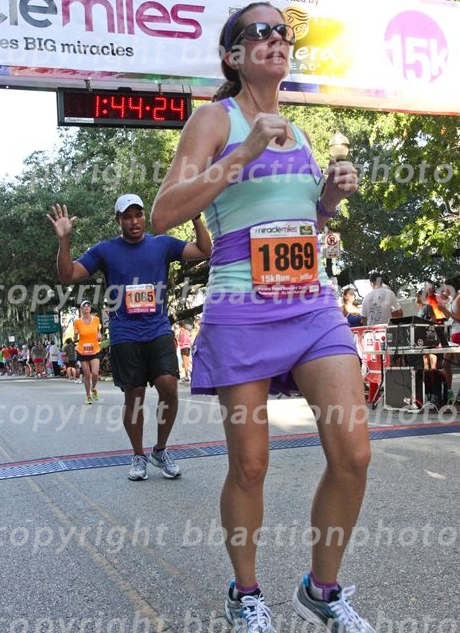 My official time was 1:42:53 with a pace of 11:02. I was 1086th place overall, 125th in my age division, and 547th in my gender. Right over the middle for everything. It was a fun race and the first of 3 race weekends in a row! !